December 5, 2018: NASCAR Racing Experience excited to announce the Richard Petty Fantasy Experience for May 29-30, 2019 at Charlotte Motor Speedway. This announcement comes just before Christmas. Racing enthusiasts, make your fantasies a reality with the Richard Petty Fantasy Experience. This once in a lifetime experience is truly a unique experience exclusively offered with NASCAR Racing Experience at Charlotte Motor Speedway. This Fantasy Experience includes everything you could dream of and more including: Meet and Greet with Richard Petty, Photo ops, Autographs, 43 Car Race Shop Tour, Lunch at the 43 car race shop, (3) 10 lap driving sessions, Unlimited Go Karting at The Speedpark, NASCAR Ride Along, , Two hotel nights, Bus, Video, Custom Commemorative Ring and MORE. This all inclusive package costs $5000 and is available for purchase now on www.NASCARRacingExperience.com or by calling customer service at 704-886-2400. 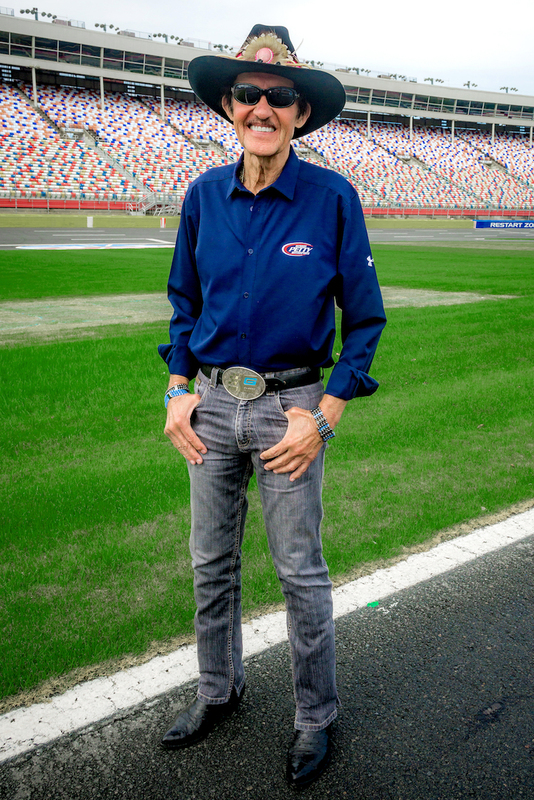 “We are excited to offer such a unique racing experience package with racing legend, “The King” Richard Petty. It’s definitely a bucket list item for sure and is forcaseted to sell out fast” said Heather Lutz, VP of Sales and Marketing.A very limited amount of space is available for this exclusive experience. For more information and detailed itinerary on the Richard Petty Fantasy Experience, CICK HERE. FORT WORTH (November 3, 2018) – Motorsports’ leading fan driving experience partners – Driving 101, which operates NASCAR Racing Experience, Richard Petty Driving Experience and Mario Andretti Racing Experience – announced today they will open a permanent location at Texas Motor Speedway. Through the partnership, they will offer racing dates year-round to race fans, thrill seekers and corporate executives. To promote the partnership with Texas Motor Speedway, NASCAR Racing Experience will sponsor the No. 43 Chevrolet Camaro ZL1 of Bubba Wallace at the AAA Texas 500 at Texas Motor Speedway. It is the second time that NASCAR Racing Experience has sponsored his car. The legendary Petty blue race car will don the NASCAR Racing Experience stripes on the hood, rear deck lid and fenders for the race. As part of the expansion to Texas Motor Speedway, NASCAR Racing Experience has engaged Legends exclusively as the onsite corporate sales agent for the property. “Legends is excited to partner with the NASCAR Racing Experience to help create more awareness around what is a truly unique experience. We believe there is a big opportunity for growth here in the Texas market,” said Chad Estis, Executive Vice President, Legends. The expansion to Texas Motor Speedway with a full-time operation will offer year-round experiences at 7 locations.. In addition, the NASCAR Racing Experience runs at 16 nationwide speedways as well as 13 nationwide speedways for Mario Andretti Racing Experience. Legends is a holistic solution provider for brands in sports, music and entertainment. The Legends 360 approach leverages the company’s collective unparalleled experience in Global Planning, Global Sales and Partnerships and Hospitality across professional sports, collegiate, attractions, entertainment, international and conventions worldwide. We are the architects of premium sports and entertainment guest experiences. More information available at www.legends.net. NASCAR Racing Experience excited to announce EXCLUSIVE “Race Day Rides” for Las Vegas Motor Speedway and Daytona International Speedway. Both speedways will offer race fans, thrill seekers, bucket listers and corporate America the chance to take a NASCAR Ride Along on race day or during a race weekend. And the price for a Race Day Ride? Just $159. That’s a deal and great idea for this holiday season. Goin’ to the race? Take a NASCAR Ride Along during RACE WEEKEND or on RACE DAY! The Race Day Ride is an exclusive NASCAR experience. Sit back and hold on tight as you ride shot gun in a real NASCAR race car for a 3 lap NASCAR Ride Along at top speeds. From the outside, hockey and NASCAR appear to be completely different-because they are. 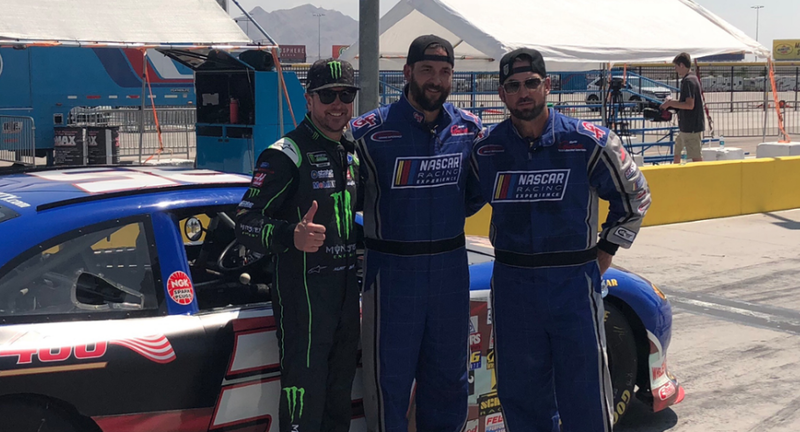 But when Golden Knights defenseman Deryk Engelland and NASCAR champion Kurt Busch traded places for a day, they saw similarities in the two completely separate sports. Busch, Engelland, and AT&T SportsNet Analyst Shane Hnidy took to the ice at City National Arena Monday morning to give Busch a crash-course on being a hockey player. Just before they hit the ice, Busch said he felt confident despite having skated only four or five times prior, though he worried he wouldn’t look as graceful as his new linemates. Richard Petty Driving Experience and NASCAR Racing Experience was just ranked in top 5 of “The Nation’s Favorite Experiences”. Making Richard Petty Driving Experience the perfect gift for Father’s Day as well as a unique gift for Graduation. NASCAR Ride Alongs are on sale starting at just $99. Dad can drive a NASCAR race car for as little as $199. NASCAR Racing Experience offers the nation’s premier speedways to full-fill this once in a lifetime driving experience. And gift giving is easy for Father’s Day and Graduation. Give a Gift Card! It’s emailed, personalized and NEVER experience. Buy a Gift Card or book a reservation for your Dad or Grad and give them a gift they will remember forever! Dreams will become a reality when you meet The King himself (Richard Petty) at a NASCAR race, plus drive a NASCAR Race Car for multiple racing sessions in the World Champion Experience. This Extreme Dream NASCAR Experience is for two (2) so you and that special someone can share the experience together. World Champion Driving Experience – at one of the nationwide locations. This is an exclusive offer with very limited quantities available and will only be offered for a limited amount of time. Meet and Greet with the King will be coordinated based on Richard Petty’s availability. The World Champion driving experience can be reserved for any of the nationwide speedways and is based on availability. Reservations are required. A valid drivers license is required to drive. In the event of inclement weather or an unforeseen circumstance the Extreme Dream NASCAR experience will be rescheduled. Call 704-886-2400 for more information or to buy your special someone the Extreme Dream Experience for the ultimate holiday gift. LAS VEGAS (Nov. 1, 2017) – Motorsports’ leading fan driving experience partners – Driving 101, which operates NASCAR Racing Experience, Richard Petty Driving Experience and Mario Andretti Racing Experience – announced today they will consolidate the organizations and their operations to deliver the ultimate on-track fan experience at racetracks around the country. Together, these three trusted brands will create an even more powerful one, with more than 150 race cars – featuring open wheel and stock cars — and permanent locations throughout the U.S. With the consolidation, NASCAR Racing Experience, Richard Petty Driving Experience and Mario Andretti Racing Experience will now be able to offer its customers more dates at more of the nation’s premier speedways. The program will expand to Las Vegas Motor Speedway with a full time operation offering 200 days a year with the addition of Mario Andretti Racing Experience and their fleet of full size, Indy-style race cars. In addition, the consolidated experience will run at 19 nationwide Speedways for NASCAR Racing Experience as well as expanding to 15 nationwide speedways for Mario Andretti Racing Experience. About Richard Petty Driving Experience (RPDE): RPDE is the worldwide leader in NASCAR race car drive-and-ride entertainment, available at speedways across the U.S. It has base locations in Las Vegas, Daytona, Concord, NC and Kansas City. For track locations, dates of operation, or to book an experience visit www.DrivePetty.com or call 704-455-9443, or stay up-to-date with Facebook, Twitter @Drive Petty or YouTube. NASCAR Racing Experience announces 19 of the Nation’s Premier Speedways for 2018! Drive a NASCAR race car or ride along in a NASCAR race car at one of these speedways in 2018. Make a reservation today or buy a gift card. Limited space is available and most tracks are forecasted to sell out in advance. We look forward to seeing you at a speedway near you in 2018! CHARLOTTE, NC (July 23, 2017) – NASCAR’s leading fan driving experience partners – NASCAR Racing Experience and Richard Petty Driving Experience – announced today they will consolidate the two organizations and their operations to deliver the ultimate on-track fan experience at more than 20 racetracks around the country. Together, these two trusted brands will create an even more powerful one, with more than 100 race cars and permanent locations throughout the U.S. With the consolidation, NASCAR Racing Experience and Richard Petty Driving Experience will now be able to offer its customers more dates at more of the nation’s premier speedways, adding Daytona International Speedway, Indianapolis Motor Speedway, Kansas Speedway and Las Vegas Motor Speedway to NASCAR Racing Experience’s lineup of Atlanta Motor Speedway, Auto Club Speedway, Charlotte Motor Speedway, Chicagoland Speedway, Dover International Raceway, Homestead Miami Speedway, Kentucky Motor Speedway, Myrtle Beach Speedway, Michigan International Speedway, New Hampshire Motor Speedway, Phoenix International Raceway, Richmond International Raceway, Talladega Superspeedway and Texas Motor Speedway. As part of the consolidation, both organizations will continue to operate under their current brands and announced schedules for the immediate future. Terms of the agreement were not available.